Accepted payment method is Pay-Pal. All patterns are written in English.1 Minute download Processing:- The pattern can be download after payment automatically.- Click "my account" - Click "my order"- Click "my order" download PDF pattern. All patterns are written in English.3 Minutes Processing:- The pattern can be download after payment automatically.- Clcik "my account" - Click "my order"- Click "my order" download PDF pattern. Accepted payment method is Pay-Pal. All patterns are written in English. 1 Minute download Processing:- The pattern can be download after payment automatically.- Click "my account" - Click "my order"- Click "my order" download PDF pattern. Accepted payment method is Pay-Pal. All patterns are written in English.2 Minutes Processing:- The pattern can be download after payment automatically.- Click "my account" - Click "my order"- Click "my order" download PDF pattern. Accepted payment method is Pay-Pal.Digital files are not refundable!All patterns are written in English.3 Minutes Processing:- The pattern can be download after payment automatically.- Clcik "my account" - Click "my order"- Click "my order" download PDF pattern. Accepted payment method is Pay-Pal. All patterns are written in English.2 Minutes download- The pattern can be download after payment automatically.- Click "my account" - Click "my order"- Click "my order" download PDF pattern. All patterns are written in English.2 Minutes Processing:- The pattern can be download after payment automatically.- Click "my account" - Click "my order"- Click "my order" download PDF pattern. Geaccepteerde betaalmethode is Pay-Pal. Alle patronen zijn in het Engels geschreven. 2 Minuten Verwerking: - Klik op "toevoegen aan winkelwagen" - Klik "mijn account" - Klik op "mijn product" download PDF patroon. Accepted payment method is Pay-Pal. All patterns are written in English. 2 Minutes Processing:- The pattern can be download after payment automatically.- Click "my account" - Click "my order"- Click "my order" download PDF pattern. Photo size: Unix. 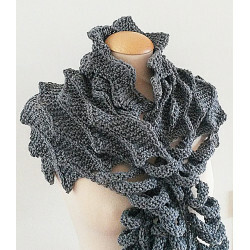 Length125cm, width33cmMaterials: 75%acrylic25%wool Color: CamelCraft 100%handmade Designer's words:Unique look of a cowl/shawl braid ladder. 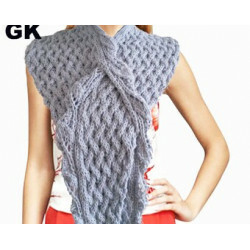 It can also used as shoulder cover.Order to made is aceepted, lead time 5-10 days.